The folks behind Apps for Communities are ecstatic when the community talks about how our app challenge will make the information you need more useful in your daily life. We want to share some of the many great tweets we’ve appreciated this summer. What do you think? [Correct answer: Yes!] Holly continued, “Enter the Apps for Communities challenge! http://t.co/7ewlin #nptech @jakebrewer". We can’t wait to hear! He ended up polishing an app he’d already been working on rather than starting something anew. We love it when word gets out to large followings like @nonprofitorg’s! The deadline has been pushed back to accommodate our judging panel’s desire to take a close look at all entries and to allow more developers to enter apps. We thank you for your continued support as we head toward the final deadline of October 3rd! There are so many others who’ve been making this campaign fun on Twitter. Thank you! See you on social media! 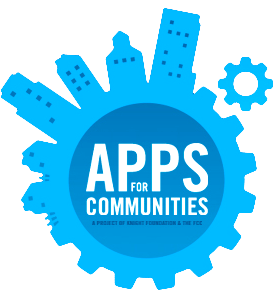 Remember to follow @communityapps on Twitter, or the Apps for Communities Facebook page for updates and news.